Additional information and a digital perusal score are available here. While Toward the Splendid City was composed as a portrait of New York, the city in which I live, it was written almost entirely away from home. Work on the piece began in Seattle in the spring of 1992 and was completed in mid-August of that year...At the time I was nearing the end of a year-long residency with the Seattle Symphony, and had serious second thoughts about returning to New York. Life was always complicated in the city and easier, it seemed, everywhere else. I was, however, not without a certain pang of nostalgia for my home town, and as a result Toward the Splendid City was driven by my love-hate relationship with New York. It was, needless to say, a relationship badly in need of resolution. It is also a portrait of the city at a time when New York may have been at its most vibrant. Part of what made New York feel so alive during (the 1980s and 1990s) was a sense of optimism that was felt by many of its citizens, and its landmarks (the New York skyline, Central Park, Yankee Stadium, Fifth Avenue) were, and to some extent still are, visual manifestations of that optimism. Since 9/11, and following some of the financial challenges that the country has been wrestling with, this sense of optimism has faded somewhat, but the energy still remains. May this new edition continue to reawaken the sense of optimism that we all want to experience now or at any time. Rubies is a version of Thelonious Monk’s Ruby My Dear, which he composed while still in his teens. When I was invited by the Seattle Symphony to make a short piece reflecting my first musical passions my thoughts were of Bach and Monk. Since I had recently made some Bach-like chorale preludes, I chose to make a version of Monk’s tune, first in a chamber-musical, contrapuntal manner, then in the grand orchestral style I had always heard lurking there. An elaborate set of variations on a traditional four-measure repeating harmonic pattern. Instrumentation Comparison between the 1915 and "Centennial performing edition"
The Centennial Performing Edition incorporates all of the original music for wind band that Saint-Saëns composed in the ending section of Hail! 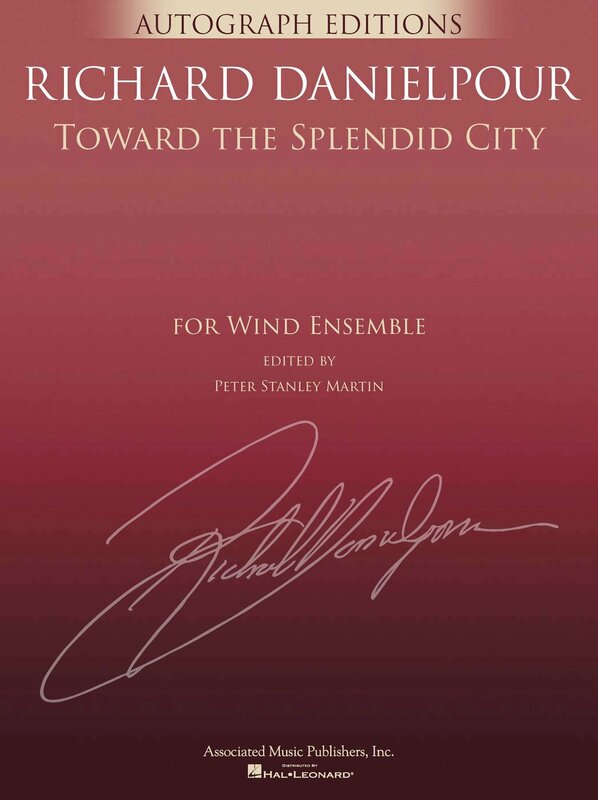 California now edited for contemporary wind bands, as well as including the orchestral material, now arranged for band, into one comprehensive performing edition. Of significant interest, the full score manuscript also includes Saint-Saëns's orchestration of the two organ interludes if an organ was not available – or possibly if technical difficulties occurred, like at the premiere in 1915. Previously, Saint-Saëns had composed three known works for band: Orient et occident (1869), Hymne franco-espagnol (1900), and Sur les boards du Nil (1908). With the “Finale” to the massive Hail! California, he in essence composed another work for band, this time featuring the band with orchestral accompaniment and interplay, as well as serving as a politically-charged composition: What Saint-Saëns composed for the Exposition was a work that attempted to unite France and the United States. What better way to make a statement of the French and Americans joining forces – musically and politically – than incorporating the national anthems of the two countries into his composition for the Exposition? Thus, “La Marseillaise” and “The Star-Spangled Banner” are masterfully woven together in the “Finale” of Hail! California. While the music of Hail! California is most certainly French-inspired and characteristic of Saint-Saëns's oeuvre, the use of “The Star-Spangled Banner” and the employment of the Sousa Band at the premiere lent a distinct American quality in both musical and extra-musical ways. Learn more about the "centennial performing edition"
In 2008, Google and YouTube commissioned Academy Award winner (“Crouching Tiger, Hidden Dragon”) and UNESCO Goodwill Ambassador Tan Dun to compose a new work Internet Symphony “Eroica” as part of the inaugural YouTube Symphony Orchestra project. Musicians from around the world were invited to audition by submitting videos of their interpretations of the Internet Symphony to be judged by members of leading international orchestras. There were more than 3,000 auditions from more than 70 countries. The project culminated in a performance at Carnegie Hall on April 15, 2009, that was webcast and is still available on YouTube. More than 22 million people from 200 countries on six continents have experienced Tan Dun's feeling of a global music community which is encapsulated in his Internet Symphony “Eroica”. In the words of Tan Dun: "The Internet is an invisible Silk Road, joining different cultures from around the world. East or West, North or South, and this project has created a classical music phenomenon, bringing together musical heroes from all corners of the globe. When I was conceiving this work it was during the China Olympics. On the streets of New York, London, Beijing, Shanghai, I heard the noise of people cheering and moving around beautifully. I was passing by an automotive garage and I found three brake drums from different automobiles - these car parts - and it was a beautiful sound...and I realized this is the spirit of the young. This is the spirit of today."